In the psychic world, there is a tool called, “blowing roses.” This is an easy and quick way to move energy out of our energetic bodies (yes, I said, ‘bodies’) and release energy that is weighing us down. Read on to find out how to create neutral space for yourself and be clear of unwanted, foreign energy. Have you ever noticed that you keep thinking about someone in particular? If I say to you, right now, imagine someone you know, who is the first person that pops into your head? No doubt, that person may have left their energy in your space. We are all psychic beings, some of us more developed than others, but regardless, we all can “pick” up the psychic energy of other people when we are in their space, in relationship with them, interact with them, or are thinking about them often. To clear our space and fill up on our own energy, we can ‘blow’ roses and energetically move unwanted energy. It just helps us feel clear. Sometimes, blending energy with others is like pouring milk in a gas tank. It just doesn’t work, it makes us cloudy. Are you ready to clear your space and fill up on your own energy? Follow the techniques below. Though easy, they are powerful tools. 1. Sit in a chair with your feet uncrossed and flat on the floor. 2.Ground yourself to the center of the earth. 3.Begin to run earth energy and cosmic energy. 4. Set your energetic space, your “bubble” about three feet in any direction around you. 5. See a rose in your space. Visualize sending any energy that no longer serves you into that rose. 6. Once the rose is full, send it to the center of the universe and pop it. Let’s say that you are obsessively thinking about someone. Try this with a person. Just imagine their face in the rose, and send all their energy into the rose. Again, send it out and pop it. You are not harming or hurting anyone, you are simply reclaiming your energetic space for yourself and removing energy of others. It’s not bad if they’re in your space, we merge with people all the time, but regularly clearing and moving energy helps us feel our own space and our own power and lends to our neutrality and creativity. 7. You can create many roses of different colors. 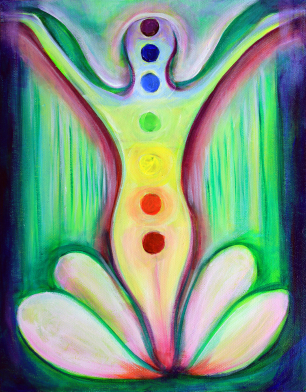 Each color represents an energy. Intuitively create a colored rose of your choice and intend to fill it with that energy. For example, create a purple rose and intend all purple related energy leave you and go into the rose. Had a long day at work? Put your entire work day in a rose and send it out. A fight with your significant other? Same thing, put the whole interaction in a rose and say, ciao! Finally, after you’ve blown all the roses you wish, it’s time to fill up on your own energy. Simply imagine a golden sun above your head. Make it at least twice the size of you. Put a magnet into the center and call back all your energy to present time. Put into the sun anything you want for yourself and your life. Be generous. Then, imagine popping the golden sun and watch it pour in through the crown of your head, as it fills every cell, every bone, every muscle, every fiber. See it pour into each Chakra, or energy center, filling it up till over-flowing. Let it fill you inside, every inch, all the way to the tips of your toes. Once your feel full to the brim with your own, vital energy, you can rub your hands together in front of your heart space and slowly open your eyes. Gently look around the room at different points and feel your clarity and aliveness.